The conventions for the Display/ReadOnly/Visible properties of grid columns (explained in Column types) are not applicable when you use FormTemplate with binding expressions for editing. You will need to take care of the showing/hiding the edited fields in your FormTemplate with custom code. 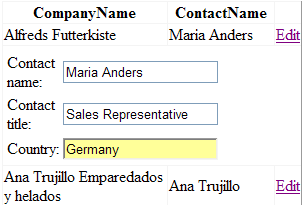 The example below illustrates how to simulate the behavior of auto-generated forms with FormTemplate. Note that our grid instance on this example contains four bound columns - CompanyName (ReadOnly = true), ContactName, ContactTitle (Display = false) and Country (Visible = false). Only the first two of them will be displayed on initial load (CompanyName and ContactName). When the user presses the edit button for an arbitrary grid row, an edit form (FormTemplate) will be visualized. Note that this edit form will present the ContactName, ContactTitle and Country fields. The CompanyName column is shown/hidden through binding expression syntax which sets the Visible property of the respective label/textbox editor.